Trump and Assad Are on the Same Side in Afrin, Against Turkey? The independent convergence of American and Syrian interests against Turkey’s anti-terrorist campaign is coincidental and doesn’t imply a “conspiracy”, but it’s also instructive in the sense that it proves that it’s possible for the most unlikely pair of countries to tacitly agree on a subject of shared interest, despite this allegedly being impossible according to the prevailing Alt-Media narrative. It probably sounds absurd the first time that the average person hears it, but Presidents Trump and Assad are on the same side in Afrin in spite of the legacy of 7 years of Hybrid Warfare that the US has been waging against Syria. As the saying goes, “there are no friends or enemies in international politics, just interests”, and nowhere is this more self-evident than Washington and Damascus’ similar interpretation of how UNSC Res. 2401 relates to Turkey’s anti-terrorist “Operation Olive Branch” against the “federal” Kurds. Syria’s position is well known, and it’s that all foreign troops on its territory without the consent of the legitimate government are illegal invaders who must leave the country immediately, but the American one might surprise some people because there’s been a false narrative spread throughout the Alt-Media that the US and Turkey are still on the “same side” despite the failed pro-American coup attemptagainst President Erdogan in summer 2016. The reason why the US is against “Operation Olive Branch” is because it fears that the campaign will prevent the Kurds from playing Damascus like a fiddle and one day getting the government to back a forthcoming offensive against the disputed Turkish Province of Hatay that Syria still claims as its rightful territory, all with the intent of sparking a conventional Turkish-Syrian war that could then make it possible for the pro-American Kurds to expand their de-facto statelet of “Rojava” all the way to the Eastern Mediterranean coast. Syria, on the other hand, views Turkey as a “greater evil” than the Amero-Zionist “federal” Kurds at this point and that’s why it’s even dispatched pro-Damascus militias to confront its northern neighbor’s forces in Afrin, though it’s thus far shied away from sending the Syrian Arab Army (SAA) there out of prudence that any attacks against it could compel the government to respond in line with the expectedly disastrous scenario that the Kurds are conspiring to create. Even so, Damascus might have still made a grave mistake by protecting the same Amero-Zionist Kurds that Turkey regards as terrorists because the government is now responsible for ensuring security in this region, meaning that the YPG could conceivably launch terrorist attacks against the Turks from this “safe zone” and thus provoke Ankara to strike the pro-SAA militias and dangerously risk catalyzing a state-to-state conflict. Nevertheless, the Syrian authorities are between a rock and a hard place, and the US knows it. No matter how vehemently Damascus condemned the Amero-Zionist “federal” Kurds for what even Kurdish-friendly Russian Foreign Minister Sergei Lavrov was forced to recognize as their “quasi-state…on the eastern bank of the Euphrates”, the on-the-ground actors carrying out this geopolitical plot are still technically Syrian citizens, and the government is afraid that employing forceful measures to bring them to peace or passively allowing Turkey to kill them off could inadvertently trigger an Arab-Kurdish civil war in the country. Not only that, but it would be an implicit admission that the YPG – a satellite of the PKK, whose leader Syria hosted from 1979-1998 – has in fact at the very least become an anti-state organization, to say nothing of the potential terrorist one that Turkey accuses it of being, which could then in effect unwittingly facilitate the weaponized interpretation of former President Hafez Assad’s decision to host YPG godfather Abdullah Ocalan as a means of “discrediting” his son and successor. Damascus therefore cannot afford, at least at this point and according to how its leadership presently views the situation, to directly or indirectly respond to the Amero-Zionist “federal” Kurds because doing so could “provoke” an Arab-Kurdish civil war, undermine the government’s legitimacy, and distract from harnessing the cosmopolitan nation’s collective motivation to expel Turkish troops from their territory. Washington’s strategic calculations are much simpler, like was explained above, but altogether the curious realignment of the US and Syria on one hand and Turkey and Russia on the other when it comes to the Afrin Kurds is instructive because it proves that it’s possible for the most unlikely pair of countries to tacitly agree on a subject of shared interest, even this appears to put them on the “same side” as their “enemies” or on the “other side” as their “allies”. 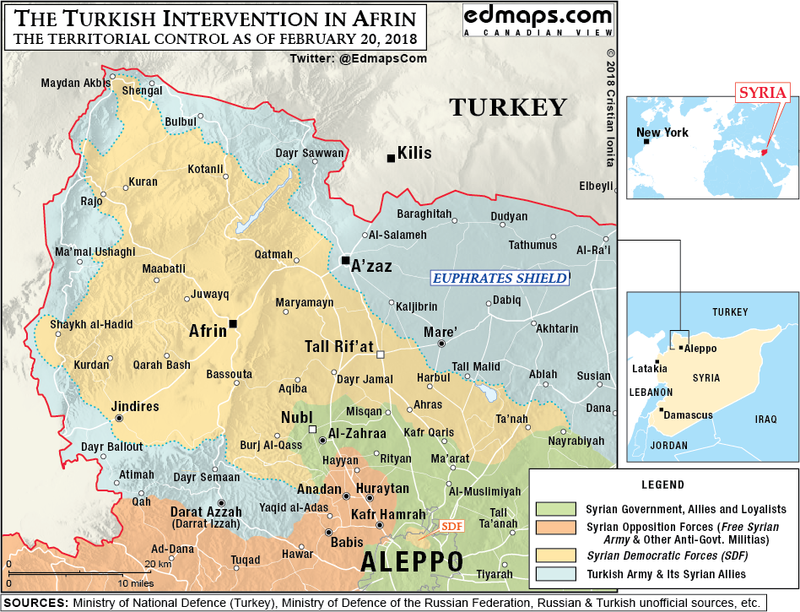 Turkey wants to crush the Amero-Zionist “federal” Kurds, and Russia passively gave the green light for “Operation Olive Branch” by withdrawing its military units from Afrin in preparation for this campaign. It’s much more important to Moscow to retain excellent relations with its Turkish/Balkan Stream Great Power partners in Ankara than to risk endanger multipolarity’s prospects in the “New Middle East” for the sake of the non-state Kurds or its Syrian partners, the latter of whom Moscow believes are “manageable” no matter what happens. Per the last-mentioned point, Russia has been trying to “encourage” Syria all throughout last year to apply the “decentralization” “suggestions” that it wrote into the country’s “draft constitution” because Moscow understands that they’re a necessary “compromise” that could simultaneously bring about the long-awaited “political solution” to the war while also allowing the Eurasian Great Power to “balance” between its peers in the Mideast by getting Damascus to de-facto “formalize” the “spheres of influence” in the country that they expect Russia to “grant” them. To that end and in the face of stalwart (but polite) Syrian resistance to Russia’s “19th-Century Great Power Chessboard” plan, Moscow made the calculated move to largely withdraw most of its military forces from the Arab Republic in order to send Damascus the message that it will not support its continued efforts to fulfill President Assad’s promise to liberate “every inch” of the country. As a response, Syria turned closer to Iran in order to retain what it considers to be its “strategic independence”, which explains why Damascus and Moscow are now on “opposite sides” when it comes to Afrin and interestingly aligning Iran’s interests with America’s in this specific case and Russia’s with Turkey’s. Again, this does not imply a “conspiracy”, but rather provides observers with two constructive takeaways. 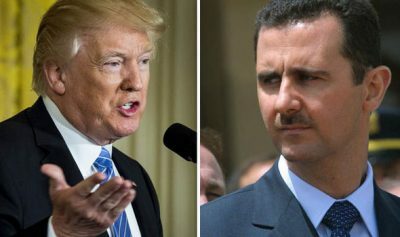 The first is that it proves that the Neo-Realist concept of self-interest does in fact play a guiding role in all players’ actions in the War on Syria, sometimes with curious results, and the second is that the dogmatic maximalist narratives propagated by many Alt-Media figures and outlets about the supposed impossibility of Presidents Trump and Assad being on the “same side” “against” their Turkish and Russian counterparts is categorically false in light of the US and Syria’s shared stance towards the Afrin Kurds vis-à-vis UNSC Res. 2401. This doesn’t mean, as these same Alt-Media actors have an “either-or” tendency to imply, that the lines in the sand have shifted yet again or that anyone is “selling out” and “betraying” their “allies” (which isn’t even possible when it comes to the Kurds), but just that the complexities of 21st-century warfare are characterized by layers of nuanced interests that result in a “gray zone” from which it’s sometimes difficult to make “value judgments” about one or another player’s behavior at any given time, let alone consistently maintaining one’s original assessment throughout the entirety of a given conflict. Accordingly, this “inconvenient fact” exposes the shallowness of most contemporary Alt-Media narratives about Syria and rightly frames them as being actual propaganda for the desperate masses, opportunistically shaped depending on however the day-to-day situation unfolds in order to sustain the sense that “their side” is “always right” and “always winning”, therefore eschewing actual analysis in favor of satisfying the fiendish cravings of their audience by delivering a narcotic-like serving of “feel-good” “alternative reality”. Whether someone thinks that it’s “good”, “bad”, or is “indifferent” to the objective reality of the situation, there’s no getting around the undeniable fact that Presidents Trump and Assad are on the “same side” in Afrin, and all feverish punditry to the contrary is nothing more than an infowar being waged by Alt-Media figures and outlets on the minds of their naive audience.